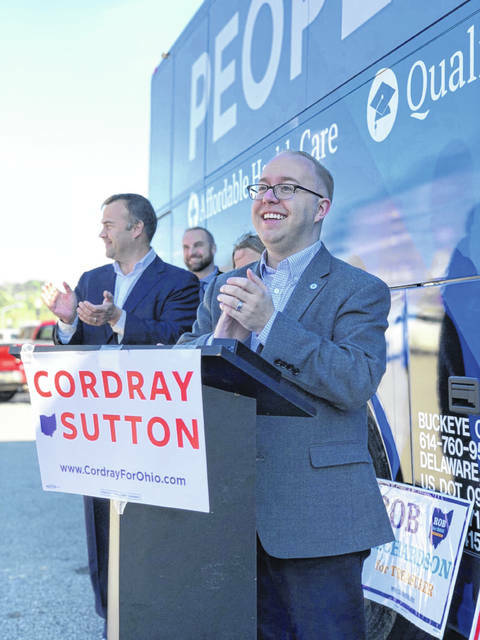 POMEROY — As part of their People First Bus Tour, representatives from the Ohio Democratic Party made a stop in Pomeroy last week. Democratic National Committee Secretary Jason Rae joined Ohio Democratic Party Chairman David Pepper and 6th District Congressional candidate Shawna Roberts in speaking to supporters on the Pomeroy Parking Lot as part of the Ohio Democratic Party’s #PeopleFirst Statewide Bus Tour swing through Southeastern Ohio. For the bus tour, Ohio Democrats are highlighting their agenda to put people first, traveling across Ohio to county fairs, festivals, rallies, college campuses, cities and villages in every area of the state all the way to Election Day. “Our candidates are committed to putting people first,” said Pepper. The Chairman noted that healthcare is the number one issue in the upcoming election, whether it be cost, accessibility of coverage of pre-existing conditions. Roberts, Pepper and Rae spoke of the importance of getting out to vote in the November election. Rae noted that he could see the headlines of Nov. 7 reading one of two ways, either “Democrats win big” or “So close”. He encouraged those in attendance to talk to their friends and neighbors about voting in the upcoming election. “Voting is important… if the people vote the people will win,” said Roberts.